Alright I have been extremely busy lately with work and other things and feel I have really neglected the blog. For your information I am working on finishing up 3 different reviews for a few different products that I think a lot of you will be interested in so please keep in touch and keep following. In the mean time, I wanted to share with you all that I have worked out the details and have incorporated an additional logo to offer as an option with my hat sales. 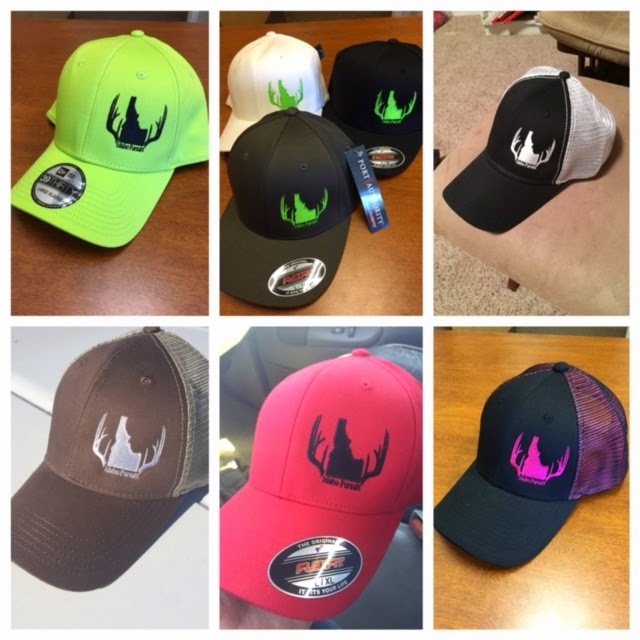 This new logo will not replace my original one but rather be an additional one which will give some variety to the outdoor activities you want to represent with your Idaho Pursuit hats. So here it is.... The Idaho Pursuit logo with the added fish/steelhead! Seems how I am a fisherman as much as I am a hunter I feel this logo will accurately represent my blog and everything Idaho Pursuit stands for! Please let me know what you think about the additional logo! Any feedback is welcome even if it's not positive. Thanks again for the support! This week Hawke Optics released a new logo, tag line, and other facelifts for their company and website. With all of this hype I thought it would be a good time to finish up and post my review of one of their products. For the past year I have used numerous Hawke Optics' products and I can't speak high enough about the customer service and the quality of gear I have used. From their rifle scopes to their spotting scopes they make sure that every product and feature they offer their customer is of the highest quality at an affordable price, especially compared to their competitors. The products I'll share with you on this post is the Hawke Sapphire ED 10x42 binoculars. 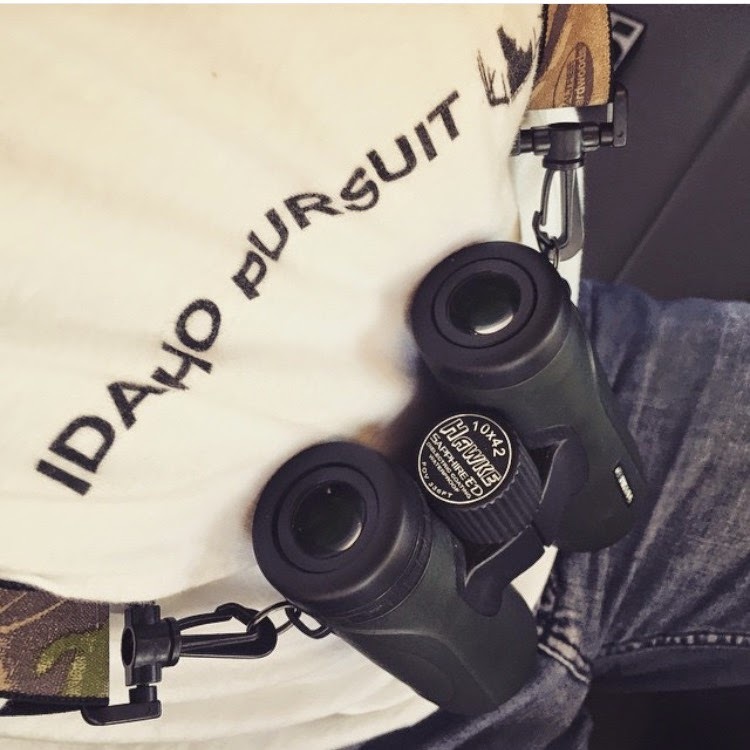 These binoculars are listed at $479 on their website and are offered in either green or black. I have used these binoculars now for about a year and have "put them through the ringer" sort a say. I have used them on my back country elk hunts, my desert deer hunts, in my tree stand, all of my scouting trips, and I have even used them on random trips with my family for recreation. I pack these things every where I go including indoor archery shoots. While packing them everywhere and using them as much as I have, I feel like I have gained a pretty good idea of their functionality and durability that I want to share with you. Check out their site to see the specifications and overview in much more detail. Now I will get into my take on the binoculars and share with you what I like about them. The first thing I like about these binoculars is their size and weight. Out of all of the different binoculars I have used, I have come to realize that no matter how awesome a pair may be, if they are too big, too heavy, or too bulky then they aren't right for the conditions I am using them for. The Hawke Sapphire binos built with the hunter in mind being 5.4" (length) inches by 4.3" (width) inches and only 1.6 pounds yet jam packed with high quality glass and amazing features. The second thing I like about them is durability... I will admit I have dropped them (in the field and down my stairs at my house), drug them through the dirt while belly crawling toward an animal, used them in the rain/snow, and even left them in my vehicle on the floor for my daughter to step on. I don't think these situations are all what Hawke had in mind when they made their binoculars, but I can testify that they work just as well after my abuse as they did right out of the box. I will state that I did have one of the stay on lens covers come off during a stalk on an animal so just be sure to have the lens covers secure when/if you plan on crawling through the brush. The third thing I will touch on is the quality and clarity of these binoculars. I have used quite a few different optics from Bushnell, Tasco, to Minox, and have borrowed even borrowed some Vortex and Swarovski optics from other hunters during archery shoots. My take on it is that optics do what they say they will do... no matter what brand you have or what style you like, they all magnify an object and help you see what you are looking at. What is important to me is that I get the best quality of product for what I pay. The last thing I want to do is pay 100 dollars for something that performs like a 5 dollar pair of binoculars my 3 year old daughter would use no matter what name is on it or how cool it looks. 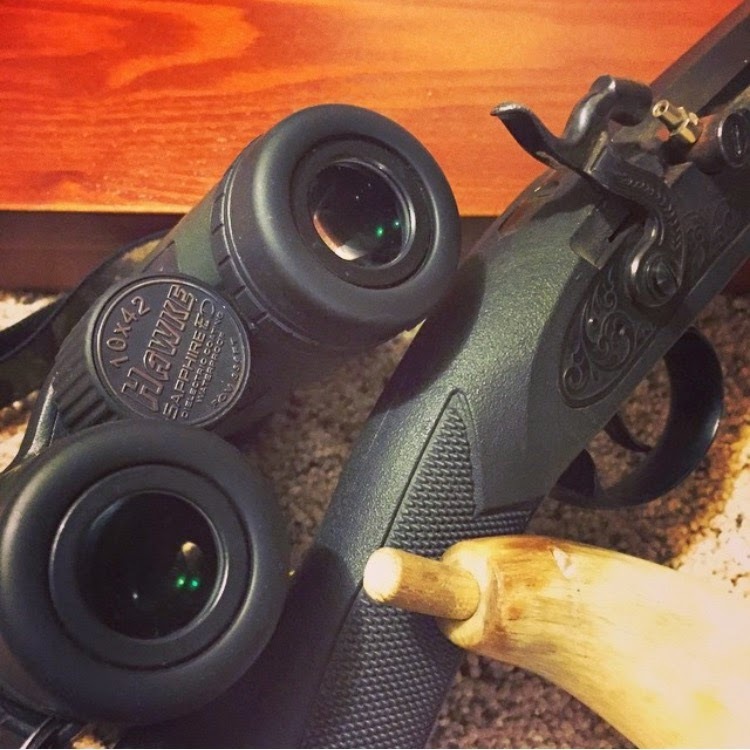 Vise-verse, I wouldn't pay 100 bucks for a pair optics that perform like a 100 dollar pair of binoculars when I could pay 80 bucks for a pair that does does as well if not better. With all of my random analogies put aside, I choose the Sapphire ED 10X42 because they are worth every bit of what they cost and then some. The construction put into these binoculars makes them the set of binoculars you will use year after year to give you the clearest look at the animal you decide to pursue. I can keep writing a few things I like about these binoculars such as the light weight rubber coated magnesium alloy chassis, the science behind the ED (Extra-Low Dispersion) glass for maximum clarity which I doubt I could even get close to explaining, but instead I just encourage you to check out Hawke Optics to see what I'm talking about. If you have binoculars that you are happy with, or a company you will always go back to, then I'm happy for you. All I am saying is that if you haven't checked this company, or this product, out then you are missing out. As I stated earlier, this company stands behind their products and takes care of their customers. Use their dealer locator on their website to find a dealer where you can check them out. If you are any where in my area I would be more than happy to take you out and let you use my Hawke Optics for a day, and I can guarantee you'll be impressed!